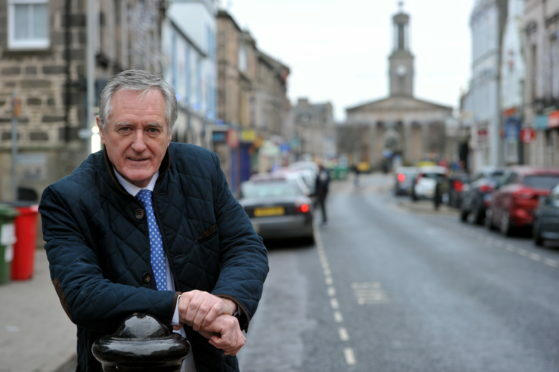 Councillor John Cowe in the High Street, Elgin. A warning has been issued about the state of Moray roads, as local councillors paved the way for them to plummet in standard. The local authority currently puts £2.042 million a year in the road network, after deciding to cap investment in 2014. The council made the decision to sacrifice the quality of the roads to save money, until it fell to the middle point in the national rankings of all 32 authorities. Now the authority, which is currently fourth place across the country, has decided to continue the policy. Critics have claimed the current ranking is “disingenuous” because it also includes unclassified roads, only 10% of which are surveyed, have showed some slight improvement. Yesterday the economic development committee met to discuss the current situation and whether the council should divert from the policy. Councillor John Cowe warned that in a few years time, the roads would have crumbled so much that they would be “three times” more expensive to fix. “We’ve been told time and time again that we will come to a precipice and so in three years time we are looking at over three times what we are spending now just to stop the deterioration. Council leader Graham Leadbitter accepted those comments, but stressed that their ongoing budget pressures meant that difficult decisions would have to be made in the future. He said: “It’s a challenge for all of us about how we prioritise what we choose to do, there’s going to be some challenging choices in the coming years, in particular with the capital spend. “We’ve also got to consider what we are doing with the school estate, with our roads and also support our growth deal, all of which are extremely important amongst the other general capital spending.